Guiry, M. (2010), "Brand Positioning in the Medical Tourism Industry: A Brand Personality Perspective," International Journal of Behavioural and Healthcare Research (eds. Teachout & Vequist), 2 (1), 20-37. 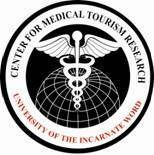 Vequist, D. & Valdez, E. (2009), Journal of Commercial Biotechnology, "The Correlation between Medical Tourism and Biotechnology," Oct., 15 (4), 287–289.